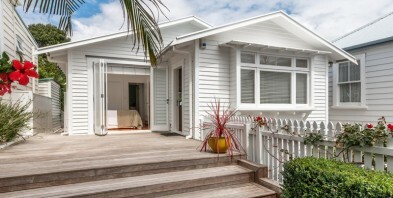 Whether a life-styler, lock-and-leaver or first home buyer, all city fringe seekers will find this beautifully presented character bungalow the solution they have been looking for. Perfectly positioned on the site to provide dual aspect living, the street setback also enables the coveted double off-street parking to be side by side. Generous decking front and rear allows for seamless living, whether indoors or out, and maximises the entertaining options in all seasons. Crisp white interiors, sloping ceilings and large windows create a light-filled interior, with the wonderful kitchen situated at the hub. Both bedrooms are double with the master opening through french doors to the garden. In this location, so close to everything, buyers seeking properties of this calibre are often finding apartments are their only alternative. Now you can have the best of both worlds - quality fitout, ideal size and spaces, character, convenience and a freehold landholding. Our vendors are relocating and this home needs to be sold. Make viewing a priority.